This was and still is the largest city park. It was built on a hill below and around the Hydrographic Institute with Astronomical Observatory (Specula di marina) with two domes, one of which was destroyed during World War II air raids. The park was systematically and carefully planted over a period of ten years on an area of some 29,000 m2, with only one tenth covered by paths. The composition of the park is symmetrical and the main axis even today is the line connecting the Astronomical Observatory – stairs – fountain – stairs – fountain. The number of planted species was neither great in the past, nor is it today, and consists of mostly Mediterranean species: cypress, pine, cedar, privet, laurel, oleander, hawthorn, etc. In the middle of the park, on a rectangular marble pedestal surrounded by luxuriant flowers, a statue of vice-admiral Tegetthoff was erected in 1877. The monument was destroyed in 1920, and during the Italian rule a fountain was built at that very site, which through a water supply system was connected with the already existing fountain in the lower part of the park. At that time Monte Zaro was an extremely well-kept and well-tended park, and the trimmed topiary shapes were elements of a ‘Romanesque garden’. Today, there are about 20 plant species and the most numerous are laurel, guelder rose, Aleppo pine and cedar. 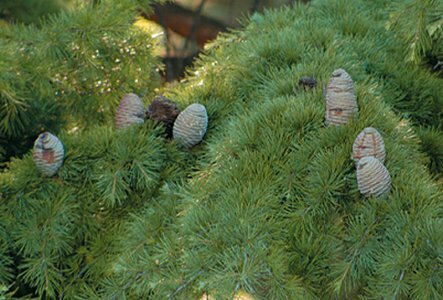 Among the cedars are Atlas cedar, Himalayan cedar and the most impressive – the cedar of Lebanon. The easiest way to distinguish them is by the arrangement of branches in relation to the trunk. 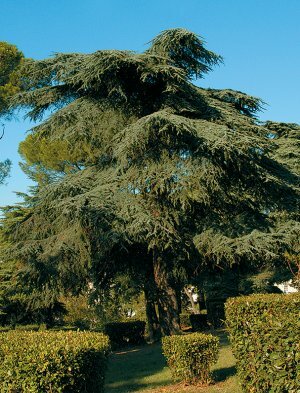 The Atlas cedar has branches growing slantingly towards the top, the top of the Himalayan cedar, as well as the tips of its branches bend downward, whereas the branches of the cedar of Lebanon are vertical to the trunk so the crown has a wide umbrella-like form, resembling somewhat a Japanese pagoda. This last species is highly esteemed in shipping and there are specimens over 1,000 years old. Another well-represented conifer is the Aleppo pine (Pinus halepensis ) which is very significant for this area since it endures salt well and therefore is often planted near the sea. Apart from that, it is ideal for afforesting and is often used as a so-called pioneer species to prepare the ground for other higher quality specimens. This is a typical Mediterranean species, which is autochthonous in our southern coastal region.